Hannah: That’s kind of a question for you Hilly, because you’re the creative one, and then I do all the organization of making it happen. Me: That’s okay, that will make it a lot easier to transcribe – I’m not that fast! Hilly: I basically see a movie in my mind. It plays out for me as I’m hearing the music and I don’t really force it, so it’s not like oh, we have to be really detailed with this scene or we have to make sure that this particular thing is there, because it’s already visualized in my head. I’m a very strong visualizer. I can’t really say where it comes from besides that God made me maybe a little too creative and he poured too much creativity into my poor little brain. Hilly: I just see it and then I tell Hannah about it and we do it. 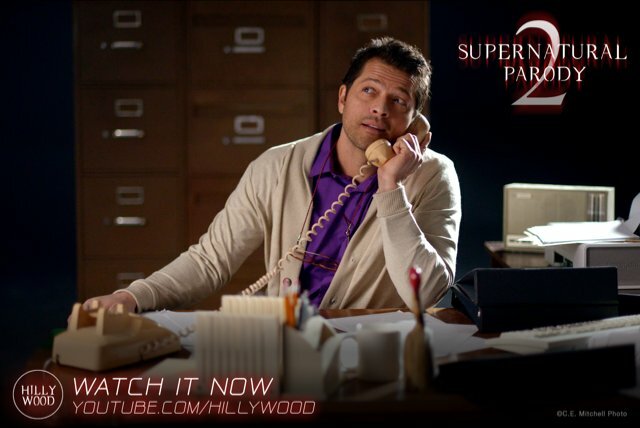 It’s not like okay, we have to give Richard an angel tie, because that will be funny. It just happens. 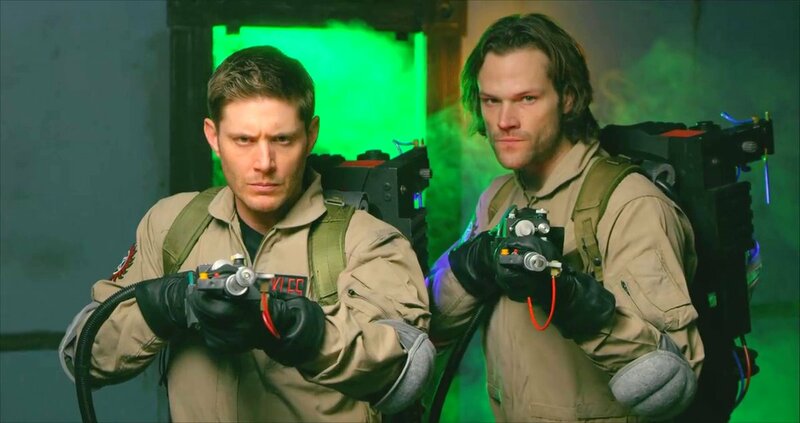 Or when we were creating the proton packs, I knew we wanted them to look like the inside of the trunk of the Impala. So, Sam and Dean would have the weapons on their backs. I knew we wanted the symbol there and certain weapons, but then it came down to, which weapons will fit? How does it look aesthetically, is it aesthetically pleasing? And does it make sense? Which weapons would Dean choose and which weapons would Sam choose? I’m sorry I can’t answer more. It’s just in my mind and Hannah puts it into action. Lynn: That makes sense to me, you both are just very detail oriented. And one of the things that makes fandom such a unique community is that fans are also often very detail oriented – the details matter to fans. So it’s a wonderful meshing considering you’re making things for fandom. Number 2. It’s not just the details of scenes that you get right – you also get the characters right, especially Sam and Dean. 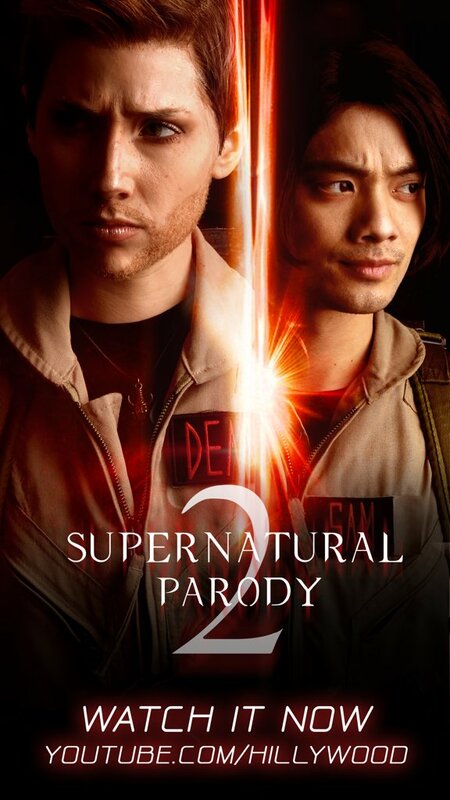 Because if Hilly and Osric weren’t believable as Sam and Dean, it wouldn’t really work. There are little quirks and personality traits that make them recognizable as Sam and Dean, like Dean in the dead guy robe going back to get his food, for example. What things did you pull in, from both a directing standpoint and an acting point, to make sure that it really felt like Sam and Dean? Hannah: OMG, that’s a deep question. Lynn: (laughing) I’m a psychologist, I can’t help it! Hannah: We’re going deep, this is fun! We’ve only done one interview, you’re the second one. We haven’t gone to cons or anything, so I’m like ooh new questions, yay! A lot goes to Hilly with regard to the acting. I can’t say, Hilly, just so you know, Dean furrows his brows a lot. Hannah: I can’t tell her that, that’s not really my job. It’s on Hilly and Osric. Before we started filming, we said study Jared and Jensen, study those characters and look in the mirror at yourself, see how your face is going to be able to portray that. Because everyone’s faces are different and everyone’s facial expressions are different, so to mimic that you have to practice. And they both did their jobs. Mainly, what I did as a director, was to watch the scene and think, is it feeling right? Do the facial expressions look the same? Is there chemistry between the two of them? Does it feel right behind the camera? Then I can say okay, we have five good takes that we can choose from. On top of that, I sit behind Hilly as she edits, so I know exactly how many takes she’s gonna want to work with. I know her vision – she’s my sister – I can’t explain it, it’s one of those things where I just know what scene is going to work. 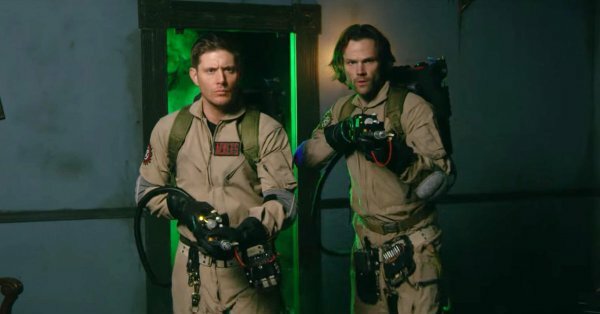 So for me as a director, it was more thinking about, this is a scene that we’re recreating from Supernatural or Ghostbusters. 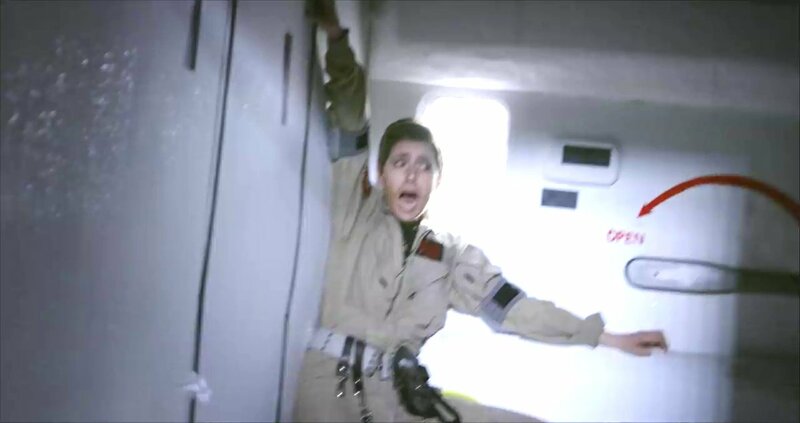 For example, the hallway scene with the Slimer, that was challenging because it was a mix of both Supernatural and Ghostbusters. Lynn: Right, that one very much was. 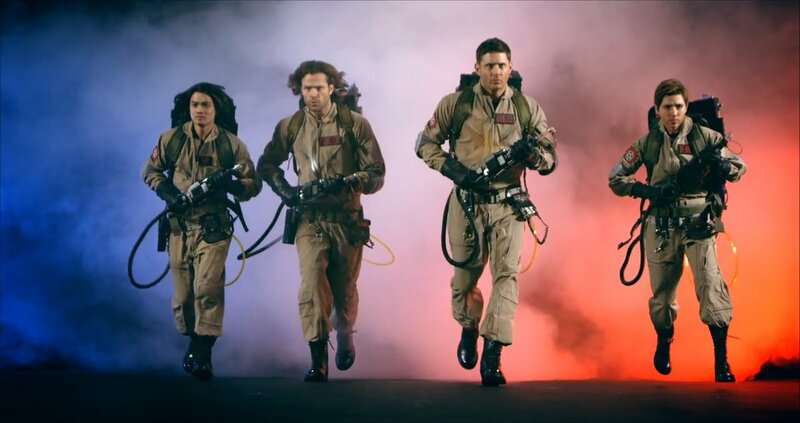 Hannah: So obviously we’re paying homage to Ghostbusters, but does it feel like Venkman and also, does it feel like Dean? Lynn: Which is tricky, because you were meshing them. I haven’t watched a ton of directors at work, but I’ve watched a few — Hannah, what I thought was so interesting was that your instincts are so good about when a scene didn’t play right, even down to asking, can you run a little differently because that’s not the way Dean would run? Lynn: And I was like OMG she’s totally right. I don’t know how she knows that but she’s right. Hannah: Well, we’ve done parodies for a very long time. When we shot Suicide Squad, I encouraged Hilly that she was doing great, but for that parody she didn’t feel like I was directing her enough. I told her that it was because she was playing a female, this is much easier. However, she kept asking me, if she was doing a good enough job. But she was — if you’re playing a male character, that’s when more directing takes place between the two of us, like how you’re running or how you’re standing. Lynn: And it’s those little subtle things that make the character believable as Dean. Hilly: Aww thank you. I will say, from me and Osric’s perspective, we had it a lot easier because we had already done the characters. So we felt like we were back where we were supposed to be in regards to acting. 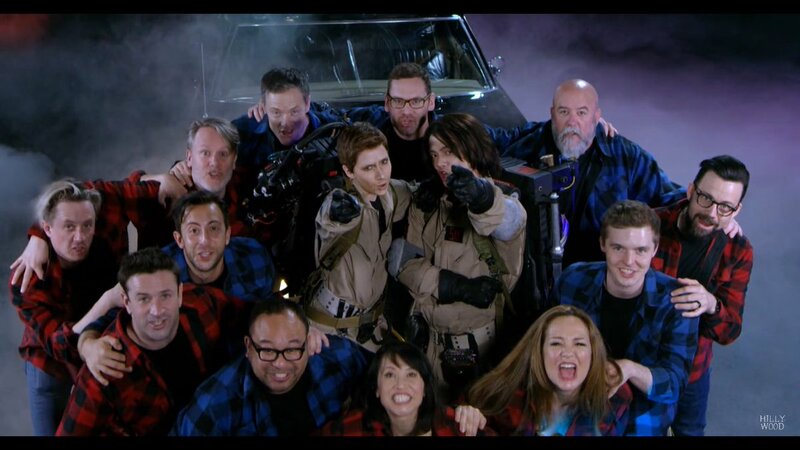 Hilly: Last time, every take Osric would have to get into Jared. I could see him turn it off and on, because he’s known Jared for so long that he can reflect the expressions. The first one, he was nervous about it, but this one I was like, show me and then I was like yep, you’re fine. For me, it was hard to get back into being Dean during the first two days, when we were filming in Kansas with the Impala. It was a little difficult to revisit the facial expressions because they were sort of rusty. I was in the Impala posing for photos and I was like, dude, I’m trying to remember, how does my face go? Hllly: But by the time we were doing close ups the following day, my muscles found themselves again. If you don’t use those certain muscles, you’ll lose the character’s facial expression. It’s like when you go to an exercise class and they tell you to squeeze your abs, and you’re like, where’s my abs? For example, if you asked me to do a Harley Quinn smile now, I’d have a hard time finding it, because that was not my smile. So for Dean, it took me a while to find my little Dean muscles again. Number 3. You include not just the obvious well-known moments from the show, but little fan favorite bits. 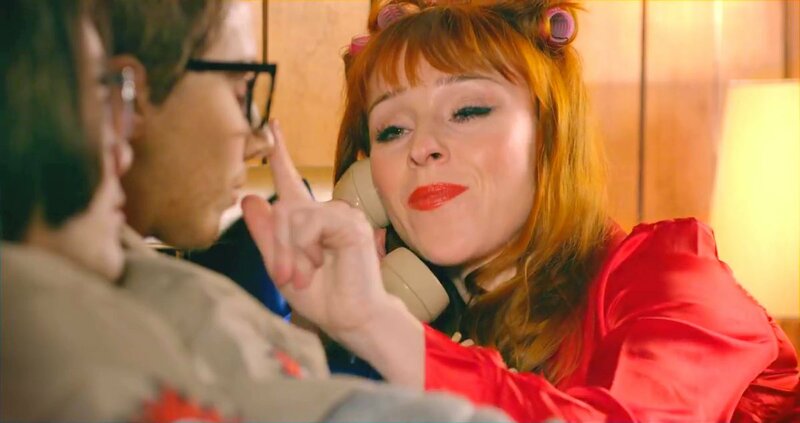 For example, Ruth Connell as Rowena ‘bopping’ Dean’s nose. Or Sam and Dean on the tandem bike from Changing Channels, or Dean terrified on the plane, or Sam terrified of the clown in the elevator. Number 4. Some of the favorite things you included are more of a thing for the fandom than the show itself, so they’re not even bits on the show necessarily but something that’s talked about alot in the fandom, almost like fandom private jokes. 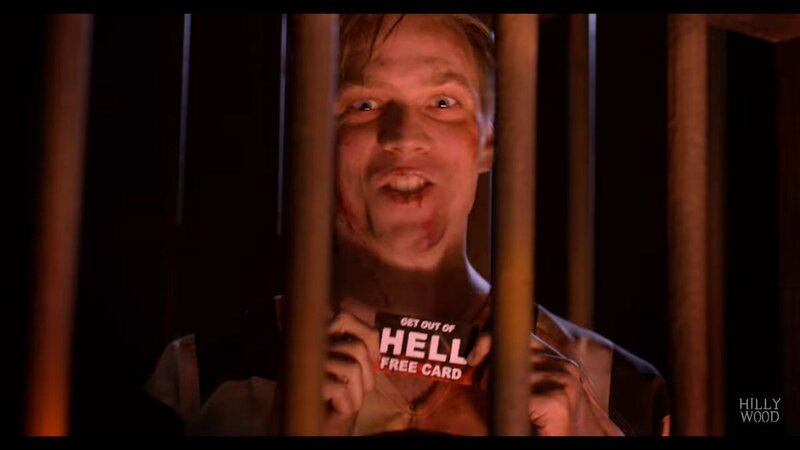 For example, the fact that poor Adam is still in hell – it was brilliant to get Jake Abel to play him too! Or the way that Sam and Dean are constantly calling out for each other – the iconic Sam! Dean! Sam! Dean! Or even that Sam and Dean wearing glasses to kill the invisible hellhound, because fandom loves them in glasses, that’s for sure! How are you able to have such good instincts about what to include? Hilly: We started by going through the lyrics, that’s when we were building the theme. In Ruth’s scene, for example, the original lyrics of the song are, “An invisible man sleeping in your bed”…so I thought what’s invisible in Supernatural? Oh, a hellhound. If Sam and Dean come to Rowena’s rescue, there would be a cute scene of Ruth bopping Dean’s nose just because I know that’s a special moment between them that stood out to fans. I wanted to include that, but then I thought oops, if they’re hunting a hellhound, they need glasses! I can’t forget that! Lynn: Yes! See, you get it – they’d need the glasses! Hilly: It was one of those moments where we had to make sure we weren’t leaving any details out. If they showed up without glasses, I’m not sure that it would have made sense that they were hunting a hellhound. Lynn: And fandom would have noticed. Hilly: It was just a matter of reviewing everything. With Adam in the cage, we thought what does the cage look like in hell? So, we found episodes of when Lucifer is in the cage. We noticed torches in the background, lightning etc. so we incorporate what we saw and hopefully the message came across clearly enough that fans could recall it. Lynn: It did, it did. Number 5. Some of those favorite things you included aren’t even from the show itself, but from promo shoots that were popular with the fans, or from the gag reel, which fans adore. You had that promo set with the chains, and the gag reel moment of Jared carrying Jensen through the woods, for example. Oh, and the Harlem Shake bit with the giant devil’s trap even! Hilly: We don’t try to force in the gag reels, it’s more about the overall vision in my head and how those things just happen to pop up. In other words, I have a crazy brain that does its own thing (laughing) I’m sorry, I can’t answer why my brain functions how it does! Lynn: Hey, I’m a psychologist and that’s totally a valid answer. I’m not a filmmaker, but I guess a lot of it is tapping into that creativity and your own instincts and maybe that’s why it works so well. Number 6. 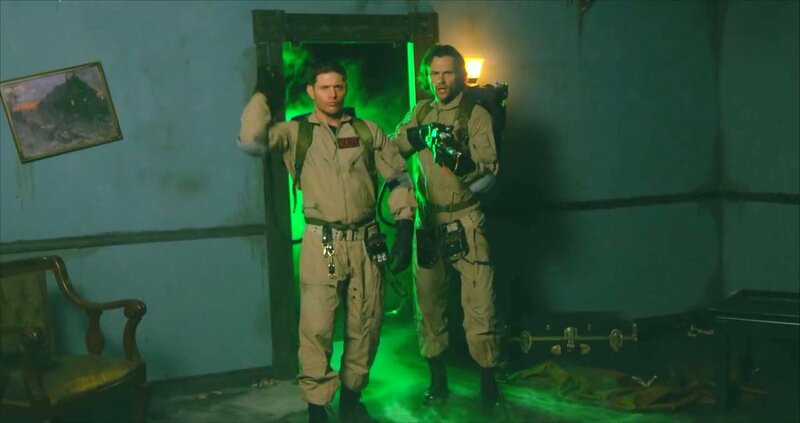 The songs you chose for the first parody and this one are both great, but this parody is also distinctive because it’s a fusion of two beloved properties, Supernatural and Ghostbusters. They’re both fan favorites for some of the same demographics. 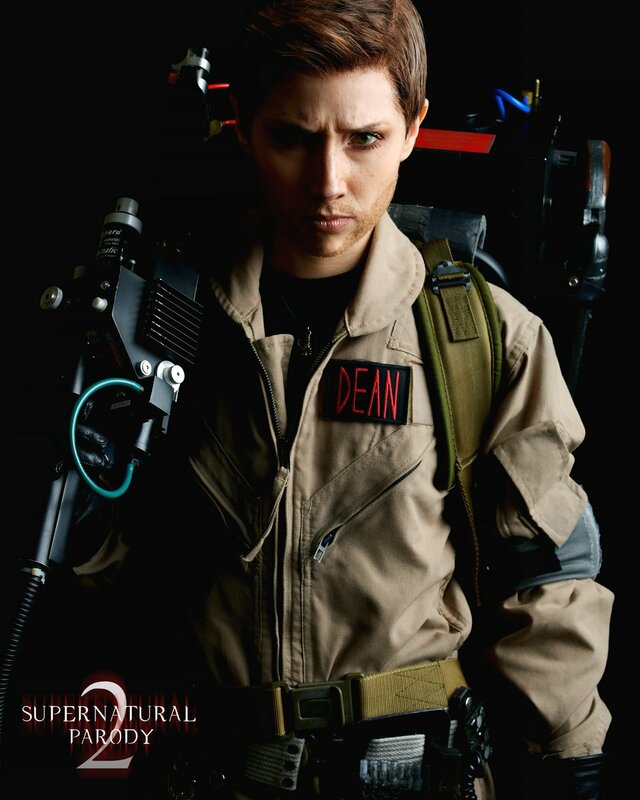 I loved Baby with the Ghostbusters topper, and I loved Misha playing Janine so perfectly. 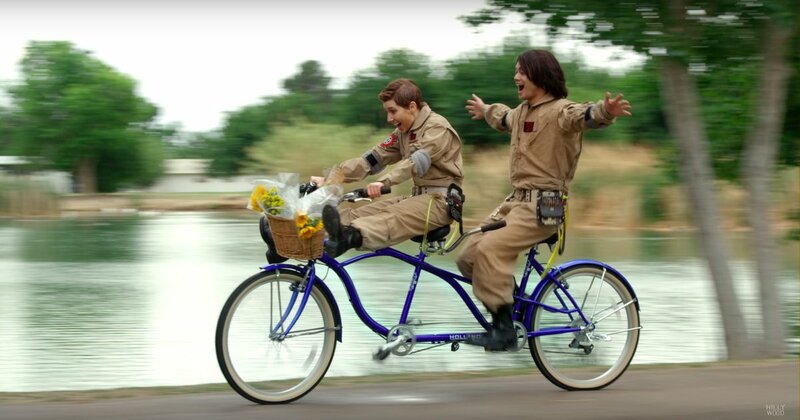 Why and how did you decide on Ghostbusters for this parody? Lynn: I’m not surprised, because they loved the first one. And really, this is a cast that relishes making fun of themselves so it’s like right up their alley to do this. Hannah: It was such a huge blessing. They’re all good people – we call it our little God story, it’s very supernatural. Hannah: It’s just amazing and we can’t thank all of them enough. Hilly and I have said the same thing forever, but we’re just two creators on YouTube. There’s a team behind us when we film, obviously, but they’re mostly friends and volunteers who have known us for years. They show up and say hey, what am I doing? You’re moving this, the camera goes here, we’re setting this scene up, okay. They literally have no clue what’s happening until that morning when they show up. We’re nobodies, we’re two sisters on Youtube, and here are a whole bunch of people who are professionals and their time is valuable. It’s mind blowing and very humbling. Lynn: I think part of the reason they all wanted to do it is that they trust you. When I put together Family Don’t End With Blood, I was just as humbled and shocked that all the actors wanted to be involved, all wanted to write a chapter themselves for the book. They said it was because they trusted me, and I think they also trust you guys to put something together that will be a loving tribute to their show, that they will love, that the fans will love. Lynn: I’m not even surprised. Number 7. The incredible number of cameos and the enthusiasm and talent that all the actors put into making the parody. 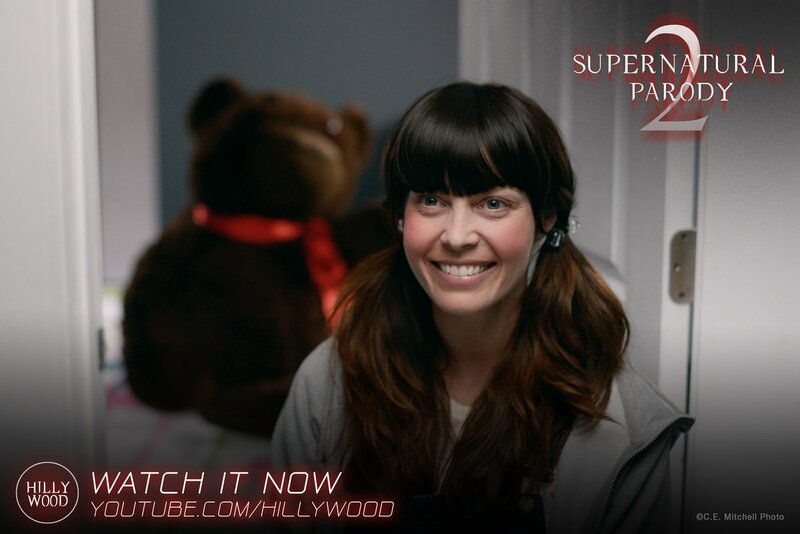 I loved Alaina Huffman with the suicidal teddy bear, and Ruth Connell with the invisible hellhounds and bopping Dean’s nose. 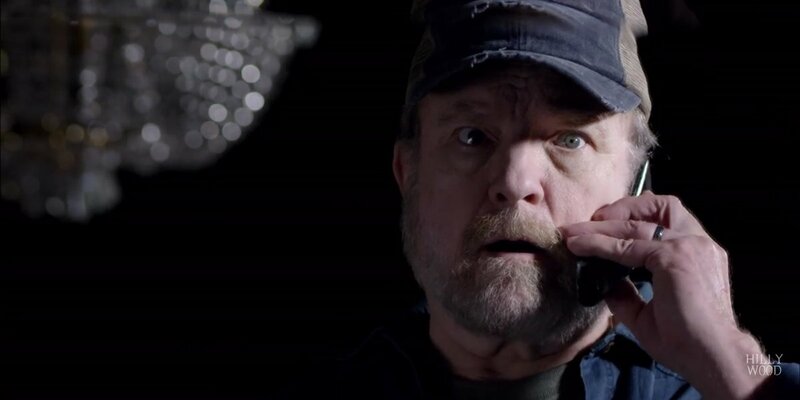 Jim Beaver looking terrified and trying to drag ‘Dean’ back from the mirror. 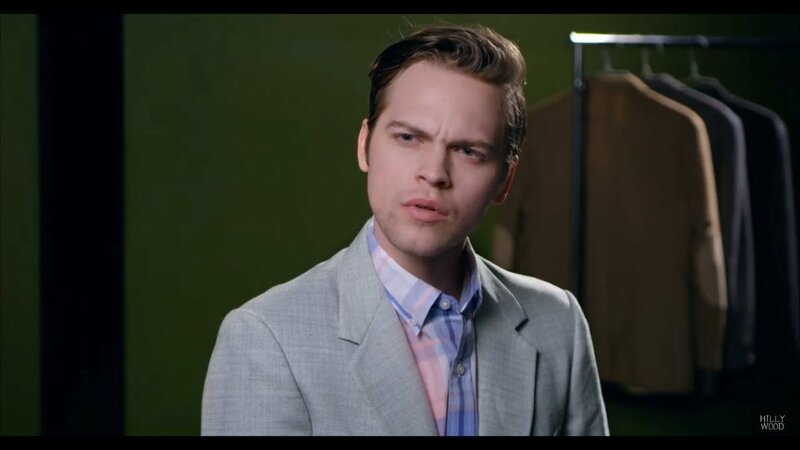 Alex Calvert being the “new guy” willing to believe whatever to be a part of all this. 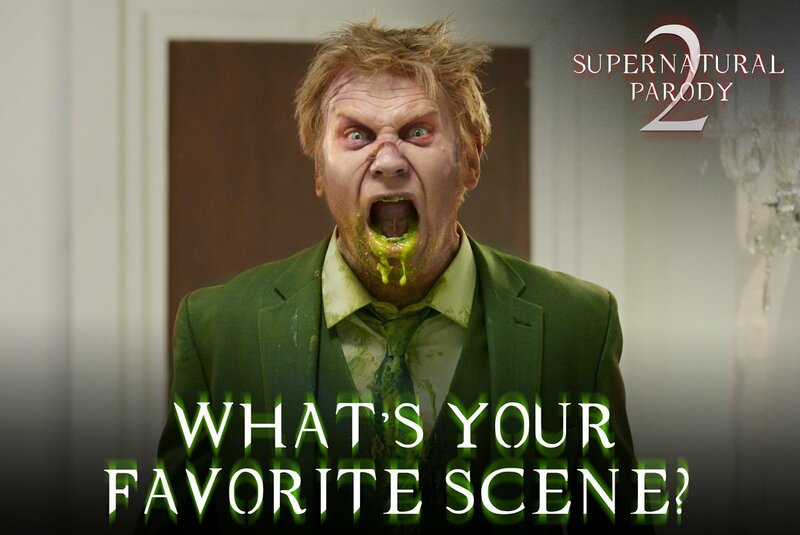 And Mark Pellegrino was perfect as Slimer with all that disgusting looking pea soup dribbling out of his mouth – he’s a real trooper! And you pulled in some fan favorites from the past too – Chad Lindberg, Samantha Ferris, Lauren Tom, Adam Fergus, Adam Rose, Tyler Johnston, Tahmoh Penikett, Jake Abel, Julian Richings, Kim Rhodes and Briana Buckmaster. Even Curtis Armstrong, and of course Rob Benedict and Richard Speight, Jr. Mother and son together again! And you again proved you understand fandom, because you even included some fan favorites who aren’t even on the show – Billy Moran, Mike Borja and Stephen Norton of Louden Swain, Jason Manns. Even Clif Kosterman! I’ll say more about Misha Collins, Jared and Jensen later, but Hannah, what are some of your favorite directing moments with the cast? Hannah: Oh my goodness, there are so many. Well, I’m the main director, but seriously without Hilly there… she was part director as well. I asked, should you be listed as Assistant Director as well? She said, oh, it doesn’t matter, but it was really cool to be able to have her by my side with Jared, Jensen and Misha because she wasn’t technically in the scene with them the entire time. That was pretty surreal for us. It felt like a dream. It was super fun to have her vision come to life and it was like OMG this is actually happening for the fans, I can’t believe we’re doing this. 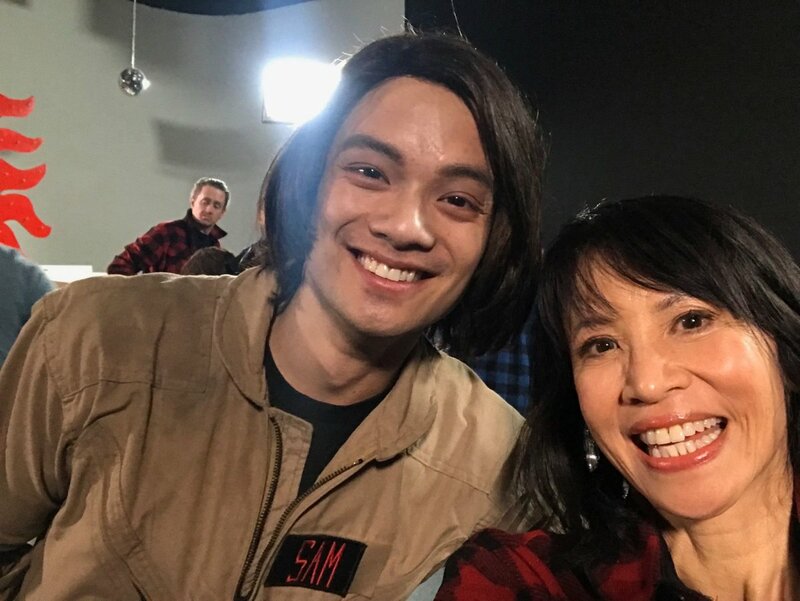 Lynn: I loved that in the behind the scenes video, the Osric floating head scene. I love that you included some bloopers in that! Hannah: For me, personally, I think it was Curtis Armstrong who stood out for me, because in the middle of filming he complimented me. He said, this is so organized, and he was saying how professional the crew was. And I mean, we are doing our best to be professional, but we never went to film school, we couldn’t afford it, we are self taught. So, that stood out to me and made me feel really good as a director. multi-tasking, she said if Mark needs to change something, you need to go tell him. We switch off director roles and different aspects. If it’s something with acting, I’m usually the one who says something. If it’s something with camera, she usually says something. So, with Mark, I had to tell him to run a certain way, to growl, to put his arms out, and demonstrate it to him. And I remember standing across the hall from him, trying to be professional and trying to portray what I wanted him to do and while I was in the moment I was thinking to myself, I must look so stupid! Hilly: Here’s this tiny, tiny little Dean telling Mark Pellegrino how to be scary! I was running and growling and showing my teeth and I just walked away thinking, I hope he got the message because I just look stupid. Lynn: And yet it came through because he looked really scary. Hilly: Well when he did it, it looked good! But I looked so silly, and I remember when I came back I told Hannah, I felt so stupid, I don’t know how to act scary like him – he was probably like oh, look at this girl trying to be intimidating! Hilly: But Mark took my direction like a pro, and he mimicked everything I said, but he just looked so much better than I did! Me: That’s true. Oops, sorry Clif! Hilly: I think they were very talented, they got the rhythm for sure since they’re musicians. You would think that they were professional actors as well because they all had fun, they smiled, they were camera aware, they were great! Everyone was super professional. We never had to help them with rhythm or say that someone’s out of time. Everyone on set took Hannah’s direction so well, had fun and looked so natural. We were so happy that it turned out so well. Hannah: Yeah, I was really surprised that everyone had rhythm, I was like, yes! It was a surprise. There’s usually someone off and you’re like oh, bless their heart. Me: It’s a good thing you didn’t have me there because I would’ve been that one. Me: I love that you included some fan favorites from the past too …. Was there anybody you would have loved to include but weren’t able to because of scheduling or something? Hilly: There was a point where we had so many actors and I wanted to bring on more, but unfortunately we no longer had the resources to afford flights or hotels, we were at our max. Before that though, we tried to schedule Felicia Day. She got on the phone with us and was so excited, but unfortunately with her schedule she wasn’t available the days we were filming. And at a point, we were really hoping that someone had a connection to Jeffrey Dean Morgan. Lynn: That would’ve been awesome! Hilly: Even if we’d been able to reach him, I don’t think it would have happened because they were filming. Lynn: Yeah, he can barely make time for conventions. Although I do think he would’ve had a freaking glorious time being on the parody if he could have. Number 8. One of the things I really loved is that a lot of the cameos had a sort of nudge nudge wink wink to their characters, referring back to the show. 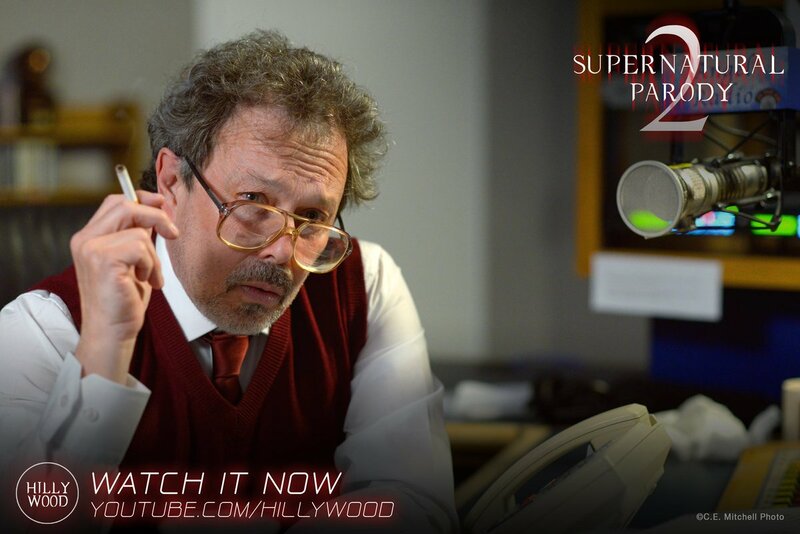 Curtis Armstrong as an Angel Radio reporter, Richard Speight Jr. as “T. 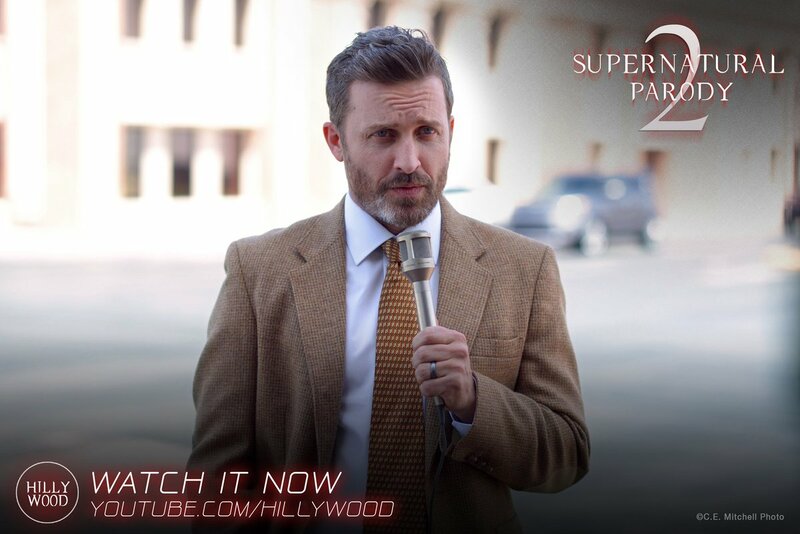 Rickster” in an angel tie and with a literal wink, Rob Benedict saying “I’ve even told a few stories myself”. 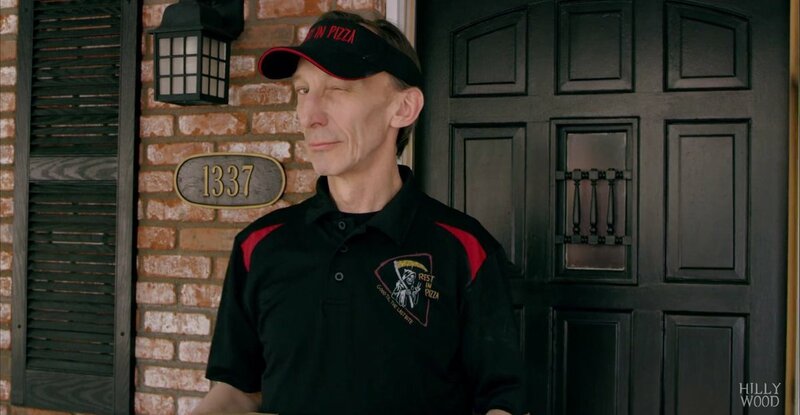 And Julian Richings delivering pizza in a “Rest In Pizza” shirt – to Kim Rhodes and Briana Buckmaster, who of course are home together. The nudge nudge wink winks provided a lot of humor – was that a conscious decision? Hilly: I think when we featured them in their roles, especially the three of them – Curtis, Richard and Rob – for them, specifically, we wanted them all connected in the news segment. We called them our celestial news team. We wanted to give everyone a wink to their character, because we didn’t want them to just pop in without any sort of reference. So, I had a reference for everybody so that it would come across as a cohesive production, that everyone was there for a purpose, it wasn’t just a hey I’m here okay bye and you’re like, why were they there? Who is he supposed to be? Lynn: Oh yes, I see what you mean. Hilly: We wanted it all to make sense and come together so fans could rewatch it and find little Easter eggs like, T. Rickster, the angel tie etc. For example we knew that Death likes his casual junk food, so we thought it would be cute if the lyrics were ‘if Death is at your door, unless you have a settled score’ — I thought what if Julian was at their door delivering pizza? So, it’s a link to his character but it also goes with the lyrics. It makes each of their cameos special so fans can recognize, point it out and enjoy it – not like, why was he a bus driver, that makes no sense! Lynn: I knew that I loved it and it was funny, but you’re right, that’s what makes it cohesive. And fans of those people would’ve been kinda disappointed if they were in some random role – instead you tied it into their characters, which made the whole parody an organic thing. Hilly: For Richard, that’s why we had him on the TV because of Changing Channels and what he put the boys through. And Curtis, because he’s an angel, of course he’s on Angel Radio. And Rob is like basically the person speaking the news but he’s telling a story, which is a call back to how Chuck tells a story. It’s just little tiny things that people are hopefully noticing – so I get excited when they notice, all that time and effort! Lynn: Well I’m noticing – maybe I’m the only one who’s breaking it out like this, but even if people aren’t consciously aware of how important those things are, those are the things that make the whole parody effective. Hilly: We like to leave little Easter Eggs here and there and see if fans catch them. It makes it exciting. We like to hide things because it makes it even more fun to watch. Number 9. Casting Hilly and Osric as Sam and Dean – because their chemistry is so much like Sam and Dean’s (or Jared and Jensen’s). That comes through just like it comes through in the show (complete with lots of fart jokes), which is one of the things that I think has made it so long lasting and successful. It really enriched the parody too, just like the show. Hilly: I remember, when we first met, I was downstairs in the Hotel getting breakfast and he approached me. His eyes were all excited and he said OMG I just watched your Doctor Who Parody, why didn’t you tell me you guys were so talented? You did such a good Jack Sparrow! I turned so red and was so embarrassed. Outside of The Hillywood Show, it’s embarrassing when a guy you just met tells you that you did a really good Jack Sparrow. It’s an odd comment. Hilly: But Osric was a sweetheart and he asked, do you guys ever have people do cameos in your videos? And I said no….and Hannah was like, is that a thing? Would that ever happen for us? And he said well if you ever do a Supernatural one, think about it. So we took that with a grain of salt. We were working on The Walking Dead Parody and me and Hannah considered Osric for a cameo. I approached him by basically saying, hey would you want to be in our next production? 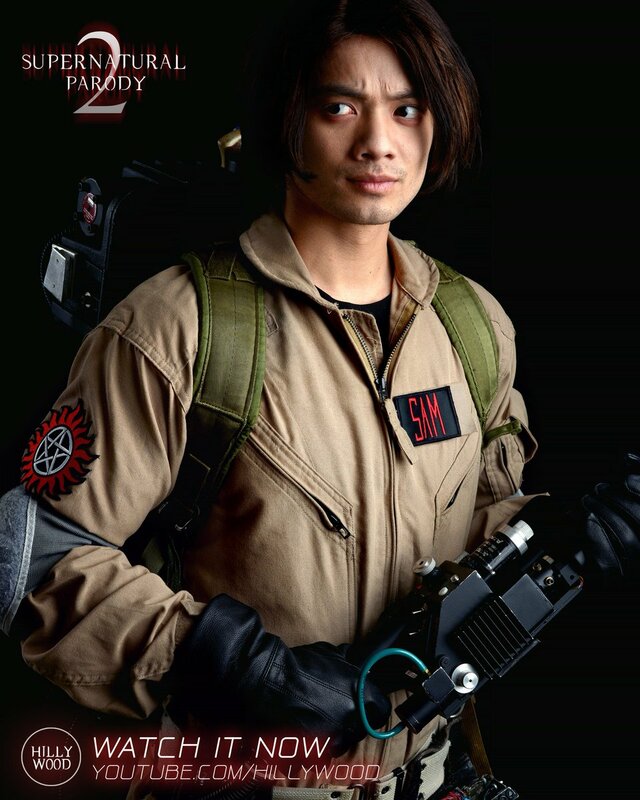 And Osric was like, it’s not Supernatural? Hilly: I said not yet. And he was like okay! 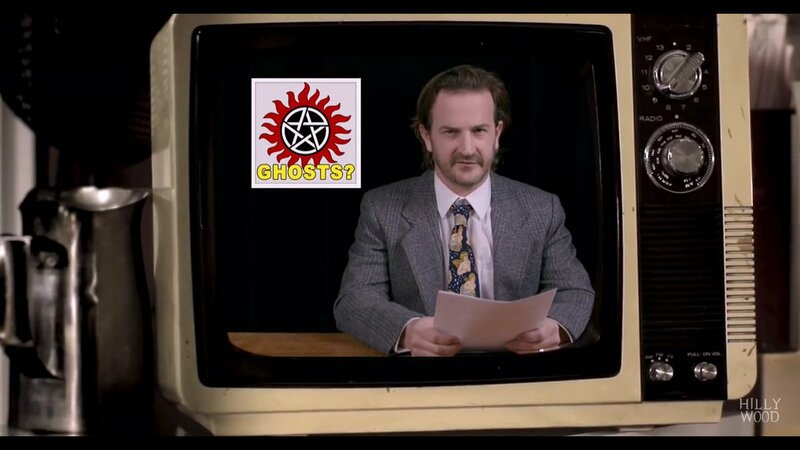 So, by the time we were in production for the first Supernatural Parody, he’s the one who went to Richard and approached him with our concept and how we’d like to feature possible cameos. So, Richard spoke to us on the phone. He then sent an email to the cast that would be at the Vegas Con and then let us know who was interested. He said, there’s no guarantee but hopefully they’ll go in and do a little cameo for you guys. So, for four days, we sat in a room with a closed door and just prayed that someone would come in. It was one after another! We’d be counting saying OMG we got three people, we got eight people! 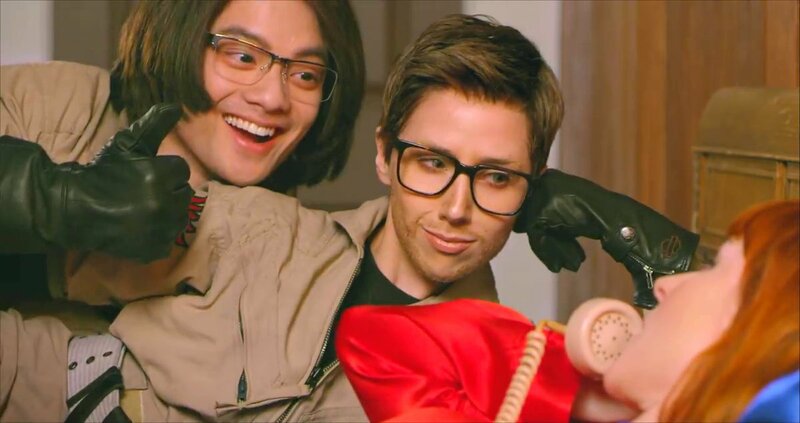 A year later, Osric had a cameo in our Sherlock Parody and then came Supernatural Parody 2. When approaching him with the concept, I told him that, the only thing is he’d be in it way more. It’s Sam and Dean 100% of the time in my vision and that he’d have to take, how many days, Hannah? Hannah: It was 17 days of filming but that didn’t include the travel, to Kansas and everything, so it was roughly 20 days out of his schedule. And he was just like yeah, I’m down, I’m good. Hilly: Some people may think that, just because we know Osric, he’d do anything for us, but he is an actor and he has so much going on. Currently, he’s working on “Empty By Design” in the Philippines as a producer and an actor. He has a busy career and we’re just The Hillywood Show, we’re not some major TV network. So, when approaching him, I thought, is this too many days to ask for? But, he was so awesome about it and was like, I’m here whenever you need me, I’ll tell people that I’m working with you and that’s that, I’m in. It’s funny, when you just keep zooming out, you understand how God brings people into your life and you don’t know why at the time but as you reflect back, you realize there was a reason for everything. Lynn: That’s such a great story, from Osric’s first comment of do you ever include cameos to now when there are so many in this one! 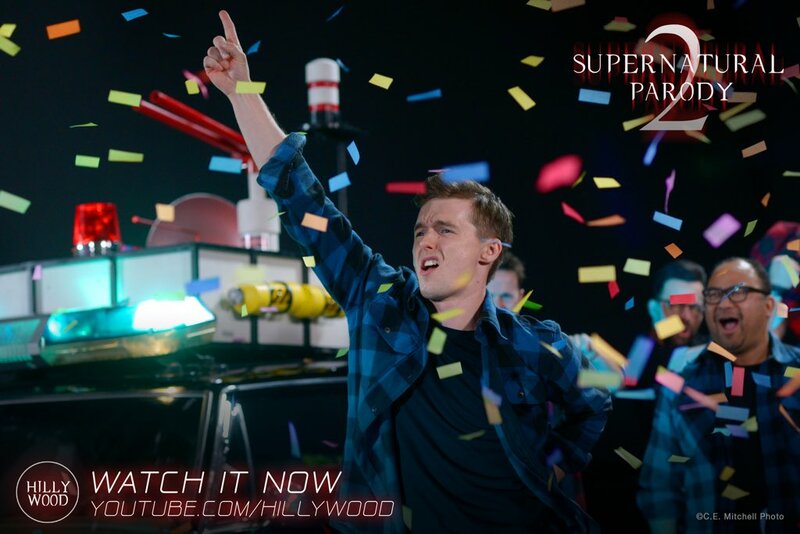 Hilly: It’s such a huge blessing, and I’ve told Osric before, he’s one of the few people who get me, and who understand what me and Hannah’s goals are. It’s so good to just be myself around him without being judged or like this is weird, or I don’t understand why you’re doing it this way. Osric is the most encouraging person I’ve met and I can be 100% creative around him, and 100% myself around him. it’s such a good thing to know someone who only wants the best for you and wants to see your vision come to life. Me and Hannah can’t thank him enough for what he’s done for The Hillywood Show. He’s awesome. Lynn: I totally agree. He also wrote a chapter for Family Don’t End With Blood, so I know how wonderful he is to work with and how encouraging. Osric Chau fan club right here! Number 10. You included two behind the scenes videos as well, which are priceless. 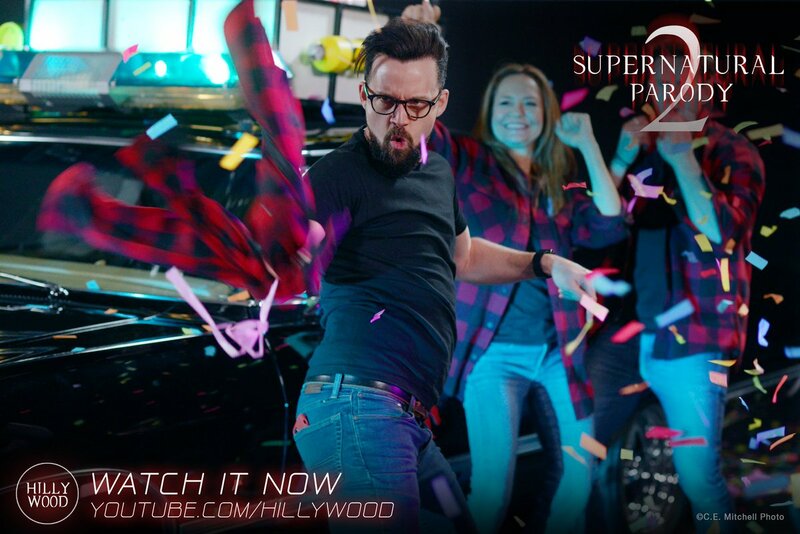 Those include some bloopers, so you have your own gag reel of sorts – Richard running out of air for his lines, Ruth cracking up about Osric’s floating head, Osric dancing with a wedgie and not knowing it. So funny! 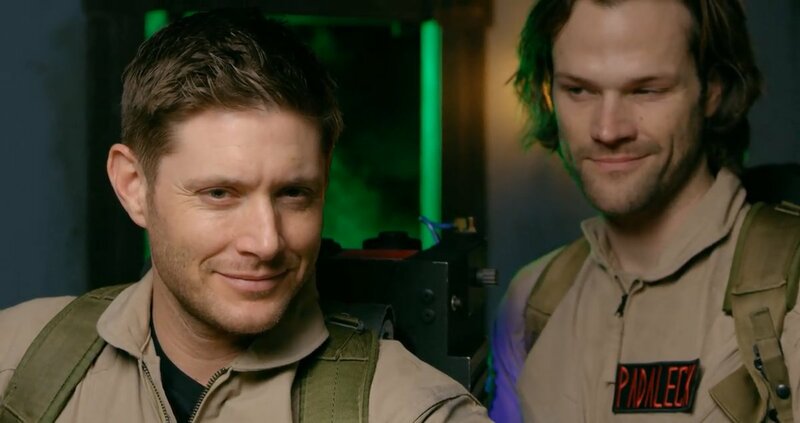 And a lot of the behind the scenes are of Jared and Jensen, which lets fans have a rare glimpse into what they’re like during filming – their process, how they respond to direction, how they interact and goof off with each other in between takes even. 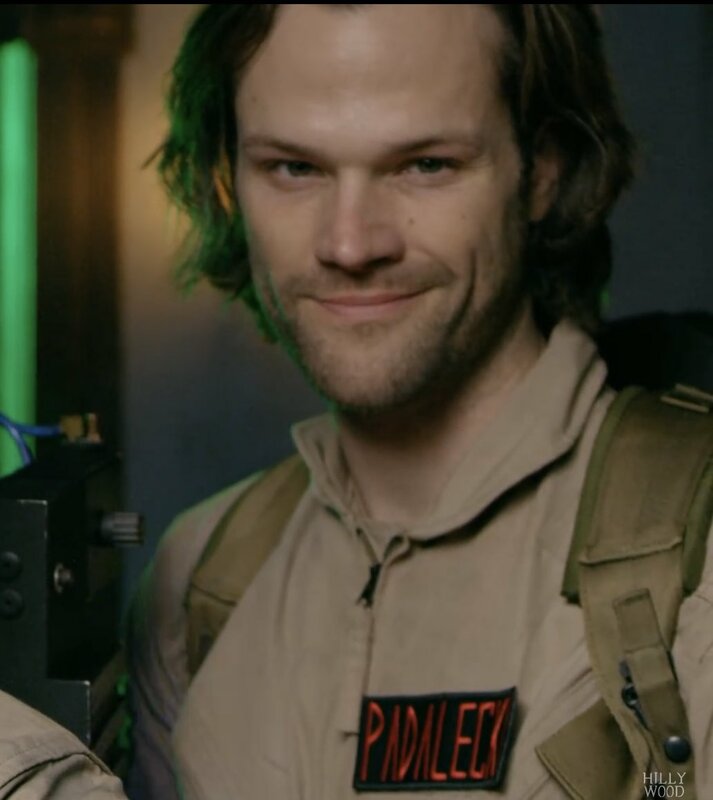 Jared: I’m a (bleeping) ghostbuster! The first time Jensen kicks the door in, Hannah gives him a little direction. Hannah: You can actually kick it harder. Lynn: I’ve watched them film on Supernatural, and this was like a glimpse of that, which is gold. When you love a show, it fascinates you to see that, and you gave that to the fans. Were Jared and Jensen on board with that from the get go? Hannah: With the first parody, when we had those cameos, we wanted to respect whoever came in. And because it was our first time working with them, we didn’t want them to feel like there was a camera up their face. With this next one, obviously, mostly everyone had met us before, but we told our behind the scenes camera operator, if you can, try to keep your distance, don’t be in their face or ask them a whole bunch of questions, just stay back and let them feel comfortable that the cameras are rolling so that they can be themselves and have a good time. We informed everyone that we had a behind the scenes camera and that it was for the fans. It wasn’t footage for Hilly and Hannah, it was for the fans to see how they are on set and the fun that they’re having. Because for them — obviously we treated it like a job, we wanted our set to be professional – but for them, it was play time. 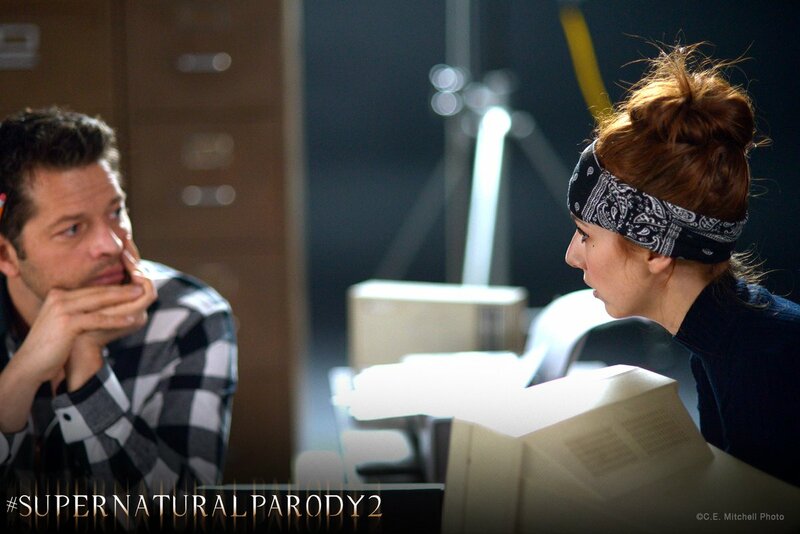 We wanted them to have a good time with playing another character, but know that it’s still within the SPN Family. Some of the cast members were there when other cast members were filming and they’d stay and watch, giggle and laugh. It was fun and laid back. They were aware of the camera the entire time, but we just kept our distance and let them do what they wanted to do and it was hilarious. Lynn: It felt very much like their own set, they’re playful there too and professional as well. That was such a gift to the fans. 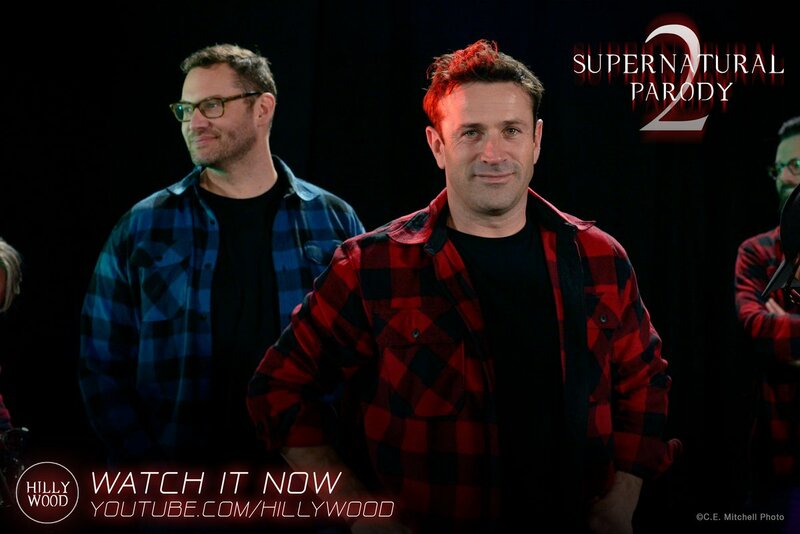 Hilly: We had sooooo many hours of footage from all the days – he just had that camera rolling the whole time – but I knew fans would like to see Misha, Jared and Jensen in their element and I didn’t want to cut too much from it when editing the Behind The Scenes feature. So what you see is a lot of the raw footage, I didn’t edit too much of it. I left most of it in because I thought it was really cool to see these guys, do what they do best. They were so professional, and we were so thankful to have them on board. It was really cool to see them act and to be in their element – this is what they do for a living and it’s amazing to watch. So it was really fun for me when editing it, to show that side – because there’s not a lot of behind the scenes with them. Lynn: No there’s not, and it was wonderful. Hilly: So, as another actor, it was really cool for me to see how they respond to direction, how they take it, how they’re so alert. We were very nervous that we wouldn’t be up to their professional standards, but they were just so cool, they made us feel very comfortable and we all just had a good time. I’m so happy that you watched that, it was super long to edit – I was like dang, this is two hours! This one was 17 days and if I had to make it into an hour, I’d be cutting out like 7 days. So I asked the fans, are you guys cool with a 2 hour feature? And they were like, we want it all! Lynn: It was very well edited. I wanted to watch it last night because we were chatting today and I thought well, I’ll put it on and then I’ll work on some other things while I’m watching – but then I put it on and just watched the whole damn thing and didn’t get any other work done! Hilly: Yay! Thank you so much. Lynn: I also thought Misha deserves a big shout out, especially because he’s playing a totally different character and he got it so right! From the moment he opened his mouth, I was laughing hysterically. Hilly: Misha watched the scene with Janine, we sent it to him a few weeks before our film shoot, but he was busy filming on Supernatural so we weren’t sure how many times he had been able to study it. On our set he asked to watch Janine’s scene again. We showed it to him and he was like, one more time? And we showed it to him again. After that, it was like, he installed it, downloaded it and done! We were like wow, Misha, that was great! Before working with us, I’d only seen what he has done on Supernatural, so it was really amazing to see how well he can impersonate! That’s very hard. Lynn: He did, he embodied that part! Hannah: I think the thing that really stood out to us about Misha — obviously there are points where, for example, we in our minds see a shoot go a certain way. I thought there might be times when we’d have to tell him how to sit at the desk like Janine or how to hold the phone like Janine, because we’re recreating scenes and we’re really, really picky with how we want it to look. So I was nervous and wasn’t sure how much direction I really wanted to give him. I didn’t want him to think I was saying, you’re doing this wrong. It’s not that, it’s just that we’re being this picky because we know fans of Ghostbusters are gonna pick up on it. Hannah: So I remember thinking, how much direction can we give him without him feeling like, oh god these girls… Unless you’re familiar with how Hillywood recreates scenes, it might become confusing. So, I was so nervous. I remember I had demonstrated it for him and I said okay, it’s in the right hand, she grabs the pencil with the left hand, and like I don’t know how he did it, but he embodied her body movements and mimicked her positioning perfectly – it was crazy! We didn’t have to tell him anything, he just did it. We didn’t have to correct him or say oh well, she’s a little more like this or that, he just knew how to impersonate – I had no idea he was so good as impersonating, because I’d never seen him do it! Hannah: I remember two things that stand out. The first thing we did was the door busting down. We did the first take, and I was like, that looks so good. It was better than what I’d thought. Jensen knows how to kick down those prop doors! Hannah: He’s only done it a couple dozen times…. So that really excited me to continue with the filming, because I thought, if the first shot is looking that good, I can’t wait to get the rest! I really liked the running through the fog scene too, the ending. All they kept doing was giggling. It looked great, but they were all asking each other, why are you sprinting? Or, were we all in time? And, why aren’t we all on the same leg? Well, I’m trying to follow him! (laughing) It was just so funny to hear them trying to figure it out amongst themselves. Everyone was very comfortable by that point and Jared and Jensen were trusting the footage that we were filming by then because they could see what we were capturing and it excited them. So everyone was more loose and having a good time, because it was the last shot. Hilly: I think one of my favorite moments was just working with them. Seeing them in their costumes was incredible. Hilly: And FYI for people who want to know details, we had to buy three of what I’m gonna call ‘the big jumpsuits’. Clif gave us their jacket sizes but we weren’t quite sure how they were gonna fit. And I asked Hannah, what would happen if Jared or Jensen put it on and it won’t zip up?! Hilly: So little Hillywood had three giant jumpsuits on hold in case they didn’t fit. (laughing) And the original sizes worked, so one jumpsuit kind of went to waste. Hilly: They looked great. A cute moment was when Hannah was setting up the last shot and I was talking to Osric, just making small talk, and Osric asked me when my birthday was. And I said it’s March 2, and I heard Jensen behind me go, when? I told him, then he said mine is March 1 and we started giggling at that. Then Osric asked, Jared when’s your birthday? And he said I’m July 19, and Osric goes I’m July 20! Lynn: Which is so weird! 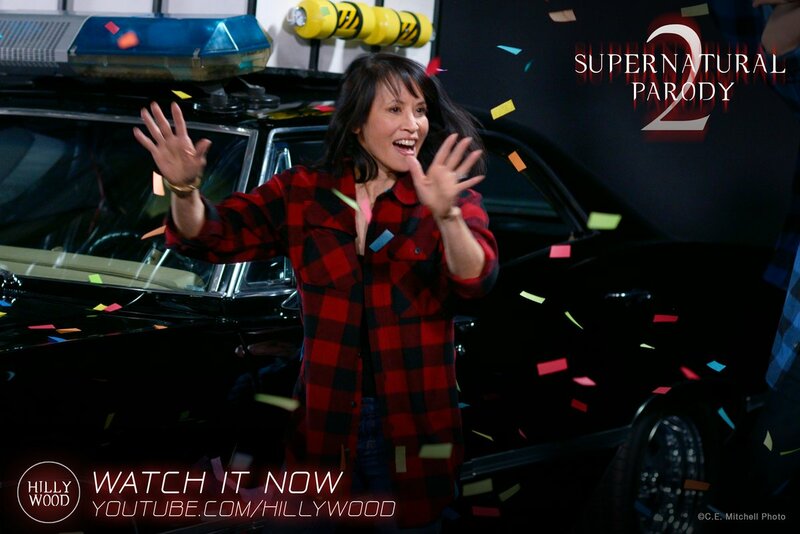 Hilly: And we stood back for a moment and I said, me and Osric are your shadow selves! And we all started laughing. Hannah called us over to set and Jensen said, March’s in front, July’s in back, here we go! It was such a creepy and strange coincidence. Lynn: I love that you included you all lining up by birthdays in the behind the scenes. Hilly: Yeah, that was right after we had that conversation. You just don’t think about it. We knew our birthdays were close but I didn’t know me and Osric were literally a day after both of them. Lynn: That’s got to be statistically improbable, so it must be some weird meant to be thing. Hilly: It made us laugh. I’d also just like to add that for Jensen to even say ‘that the shoot was so professional’, I mean, our set wasn’t even that great – our little set had seams and it’s not at all up to par with what they deal with, so we were a little shy about that. Lynn: But I think, yes of course it’s not the same as a film set, but the way you make it work and your attention to detail and the way you keep a sense of humor, it does remind me of their set. Hilly: Thank you so much. Me and Hannah, we’re really nobodies. We have no company behind us, and we hope that a Network will pick us up or someone will want us to appear on something else outside of Hillywood to help us take that next step. I think the biggest misconception people may think is that oh, Hillywood have made it, and that we’re a big company and a big team, and we’re not. It’s just me and Hannah. Whenever you receive merchandise, it’s because we’re sending it out and packaging it ourselves. That’s the biggest misconception about us, people think oh they’re good, they’ve got their own thing. We’d really like to come to a point where we don’t have to ask fans for donations – when we’re sponsored by Netflix or we get invited on to this show or that show and spread our wings. We’re really hoping for that, but for now, we’re just thankful to the Supernatural cast for being a part of our little production. We hope they look back on it and feel like, it was worth it. Lynn: You’re clearly ready for that next step – you can see in the behind the scenes, it’s you guys doing it all. And doing it right. Hilly and Hannah: Aww thank you. Lynn: Jensen mentioned something about he and Jared watching it over skype – will we ever see that? Hilly: No, we just wanted to make sure they liked it. We had little skype sessions with everyone who was a part of it. We just wanted to be sure that everyone liked their cameo and hear what their thoughts were afterwards. We skyped with Jensen, Clif, Richard and Osric for the first one so we asked if we could do another session with this one too. Their reaction was amazing, it was so fun – because if anyone is gonna get the references, it’s them. They were just cracking up at every little reference, laughing and enjoying it. Hopefully we can speak more about it if it’s ever brought up in a panel, because they were a joy to skype and talk with. They’re the sweetest guys and I just don’t know why they support us so much. We feel so blessed. They’re a blessing in our lives and I hope that this is a blessing for them in return. Lynn: I think it is, they love being a part of this. It’s mutually lucky. Hilly: We’d like to say a special thanks to our Patreons. We can’t do anything without them. It’s a misconception that Hillywood has the funds because they’re sponsored, but no. This is only possible because of the Patreons. We are nothing without our fans and nothing without our Patreons. We want to make sure that our Patreons know how grateful we are. I hope they can see the magic that they’ve put into this production, because everything you see – a shoe, a sock, a tee shirt – was funded by the Patreons. A napkin on a table, the tablecloth – all those little things that people don’t think of when we going into production – they helped us. That’s why this production took a while, we were saving up for a few months before and right now we’re still recouping. We’re totally grateful to them, this wouldn’t have happened without them. Hilly: Hopefully one day we’ll be able to meet you and hang out at a convention. Lynn: I think the fans would love to have you at a con! Hilly: If enough fans send e-mail requests, then they might consider having us out. We’d love to come! Hilly: Thank you so much for doing this – we should be thanking you for retweeting and spreading it around. Lynn: I love it so much, the creativity of it, and I know the actors do too. So my pleasure! or Barnes & Noble – links on the home page here! 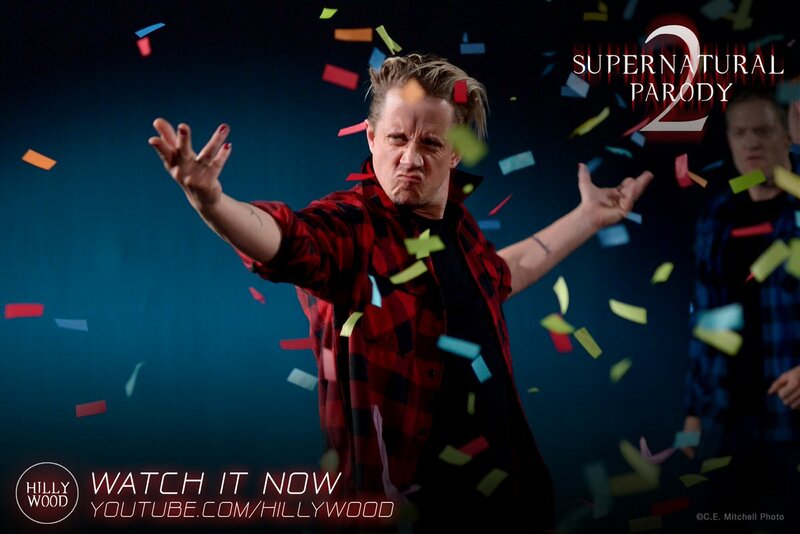 ← Supernatural Birthday Project – And Fandom Positivity! what I loved the most was when adam was in the cage and on the back of his prison uniform it says “inmate 5 x 22”. it made me laugh so hard. 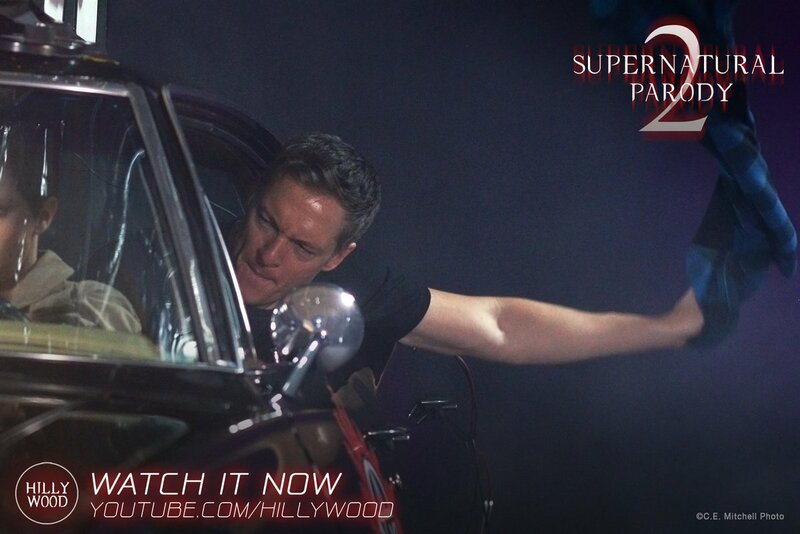 but I loved the whole thing and I actually squeed when jared and Jensen broke down the door. thank you guys so much. it was so fun. 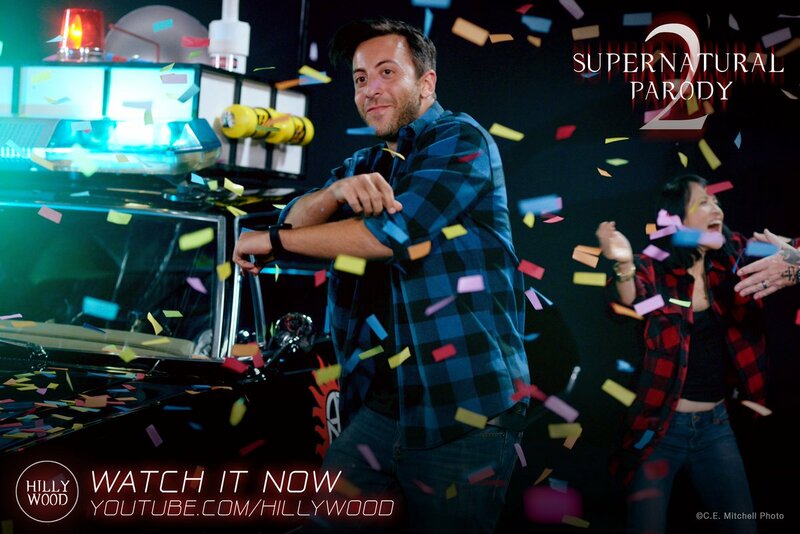 It’s that kind of little details that makes Hillywood parodies so priceless – they’re fans themselves so they get it! It’s wonderful to see the magic happen to fans who have the chance to share their passions and the love of creating for the joy of it. May things continue to roll like the Indiana Jones boulder and you continue to smash it out of y hge park! On their YouTube page, I actually left a comment wondering when some network or movie exec is going to clue in and give these two a whole schwack of money and really let them go to town. They’re that good and they deserve it. I hope it happens for them sooner rather than later. Me too – SO well deserved! Great interview! Love those talented Hindi girls. 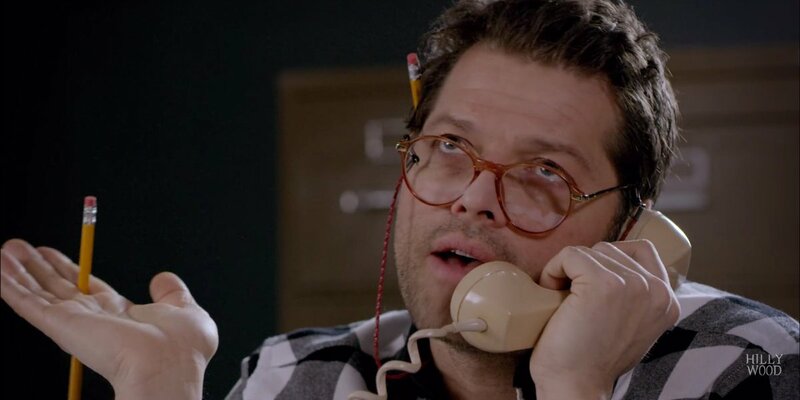 Wouldn’t it be great if Supernatural would include the parody on the Season 14 Blu ray? For a price, of course. Love the video. I’d love to have their parodies on the next dvd set – or to see them on the show itself, for that matter! Very good. Where can I contact Creation Entertainment? I had no idea that they did literally everything themselves. That is quite impressive. I know, right? That’s alot of talent right there! first time on Fangasm – love it! Just finding my way.. looking forward to the new parody. Welcome! Feel free to explore, we’ve got lots and lots of convention coverage, episode reviews and cast interviews that go back almost a decade! 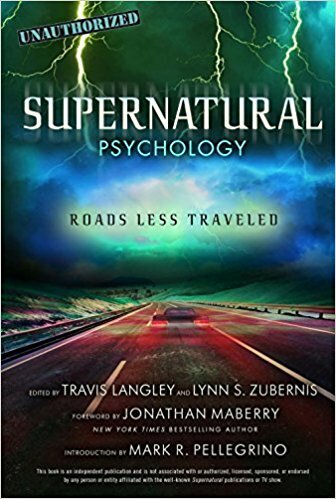 And six published books on Supernatural too, including Family Don’t End With Blood – actually written by the actors.